The McAllen Main Library in McAllen, TX has been written about in scores of news articles and urbanist websites. It is frequently hailed as a shining example of a successful big box retrofit: an empty Walmart store becomes an expansive public library. What’s not to love? But I was skeptical, especially since most of the articles about the library focus on the amazing architectural work and the glossy new photos, less on the actual experience of using the library. I wanted to hear from someone who works in this library every day about the transition from its old space to this new former Walmart and what it’s like inside. Rachel: How long have you worked at the library? Kate: I’ve been the Library Director since 2012, but I’ve been with the City of McAllen for 10 years [in several other positions]. Rachel: How do you feel about the transformation of this space from a Walmart into a library? Kate: It’s working out really well. We went from a 40,000 square foot building to a 123,000 square foot building. In our previous space, we were on three floors, and we’re all on one floor here. What I told the staff when we were moving over was, “It’s not going to be like plunking the same library into a new facility. Everything will change.” And it has. Rachel: So this design of the space is pretty different? Kate: Yes. We were so fortunate to work with a company from Minneapolis, MSR, on the design of the new building. We also worked very closely with the interior designers. Oftentimes people will design a building and the last thing they think about is the interior. But everything in this building is very well thought out. It’s all based on movement and growth. One of the many motifs throughout this building is fractals: we have the nautilus, the sunflower, and others, all based on the Fibonacci sequence. Everything is based on getting people into the building and branching them out, like a tree. One of the things I remember from when we first opened was adults would come in and say, “Wow,” and the children would be running and skipping through the space. When do you see children so excited in a library? Rachel: Has the additional space allowed you to offer new services and reach more people? What we’re able to offer in this new building is space to attract partners. We have essentially the same staff we had in our old building so we needed to figure out a way to provide new services without working our staff into the ground. We’ve expanded into many different partnerships. One example is the Marketplace Navigators. When people have to sign up for health insurance, volunteers come in to provide that guidance. That has helped to sign thousands of people up for health coverage. Another example is AARP tax assistance. We also have a farmers market outside our building every Saturday morning throughout the whole year. It has brought people who have never been to the library but love the farmers market, and vice versa; people who love the library but have never been to the farmers market. We also have our summer meals program going on right now. This is kind of a food desert. We provide that essential nutrition to children in need in the summer. Rachel: And these are services that you wouldn’t have been able to offer in the old space? Kate: Definitely. We were packed to the rafters in our old space. 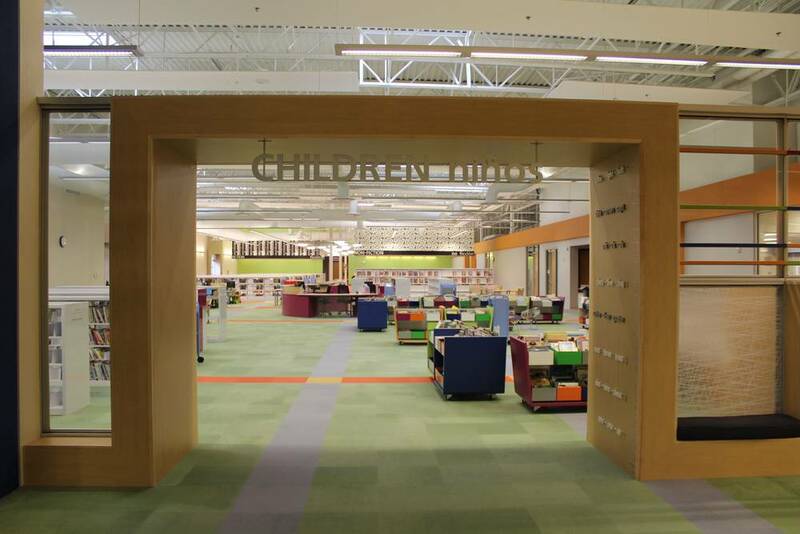 Our former facility was built before public libraries thought about defining a space expressly for young adults. Rachel: Does your new location, farther away from the downtown, make it more challenging for people to get to the library or is it just as accessible as before? Kate: Well, the old library was located in a residential area, so people who could formerly walk would now have a much longer walk to the new one. The area around the former library was the center of town in the ‘60s and ‘70s, but the entire center of town has really moved west. Our convention center and brand new performing arts building are both close to the library. We are actually in the new center of town at this point. We are also on a bus line, so people can reach the library that way, and our buses are bike friendly. Rachel: There are many empty Walmarts and other big box stores across the country. Do you think transformations like this are a realistic option for those buildings, or did this project require a large amount of financing, planning and effort that other towns might not be able to pull off? Kate: It does take a lot of planning. Like I said earlier, it wasn’t just a matter of moving a bunch of materials into a new facility. It made us completely rethink how we’re delivering library services and how we will deliver those 10 years from now. We have latitude to change in this space because it’s so big. We have a computer lab now, but who knows what technology will be like in ten years? With this space, we can adapt to whatever comes. The old McAllen Main Library. See more photos here. A Model for Big Box Retrofit? I was pleasantly surprised to hear how well the new building has functioned for the McAllen community. Taking a look at photos of the old library, it's clear that this is a serious improvement. It's bigger, brighter and modernized. It also unmistakably resembles its former iteration with a vast parking lot and auto-scale drive-thru book drop off. Ms. Horan is absolutely correct that the big box model is flexible—space-wise—and that has its advantages for a large-scale project like this. It sounds like this library is having a positive effect on the community. The question that persists for me though, is how many other large-scale libraries or similar projects can we realistically fund and how many do most towns realistically need? Walmart has 4,612 stores in the United States, an average of more than 90 per state. Walmart in particular has a habit of ditching its stores after a few years to build even bigger "Supercenters." In the beginning of 2016, Walmart announced closures of hundreds of stores worldwide, including in the United States: 6 standard-size Walmarts, 12 Supercenters, 4 Sams Clubs and 132 smaller-scale stores. And it’s not just Walmart that has a habit of leaving its massive buildings empty and unused. This April, Time magazine reported on a number of American big box chain closures planned for 2016 and 2017 including: Office Depot (400 stores), Barnes and Noble (223 stores), Walgreens (200 stores), Sports Authority (140 stores), Sears/Kmart (128 stores), Macy’s (40 stores) and Target (13 stores), to name a few. That amounts to more than 1,200 empty big box buildings. Sadly, they can’t all become beautiful libraries or community centers or schools. Most will just sit empty. The transformation of this abandoned Walmart in McAllen, TX into a new library cost $24 million, $5 million of which went to pay for the purchase of the Walmart itself. By subsidizing big box stores in our towns, then paying them millions for the buildings they leave behind, only to rebuild a completely new space a few blocks away, we support a system that is unsustainable. Several Strong Towns members who submitted their answers to our, “Is retrofit possible/worthwhile?” open question referenced the McAllen Main Library as a good example of retrofit done well, and that seems to be the case. Yet this model is not something we should be pointing to as a viable option for a majority of our empty big box spaces. The sheer volume of them makes that an impractical pipe dream. At the very least, we should stop allowing new big box stores to be built in our communities when we can barely figure out what to do with the old ones. To that end, I would advocate for a policy of #NoNewBigBoxStores.